This is a story about four rings, they are just plain wedding bands but held sacred by Eva Collins. She met the love of her life Marty Atkins in nineteen thirty-three they were married in nineteen thirty-five. 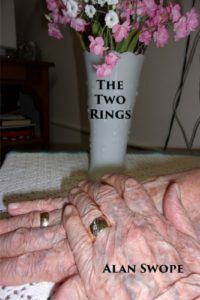 During the years of their marriage, she tried to keep track of how many times the rings parted and came back together. When they got married they picked out two rings just thin bands of gold, when their oldest son got married they gave the rings to them. A short time later they bought two more rings, they were wider and like the others just plain gold bands only hers had a small diamond. In later years Marty passed away, a few years after that their youngest son got married, she wanted his wife to have her ring. Her son drove a truck for a living and was gone those many years except for time off. The rings parted and came together as he came and went, their marriage lasted almost ten years, when it was over she wanted her ring back and prayed he would get it for her.